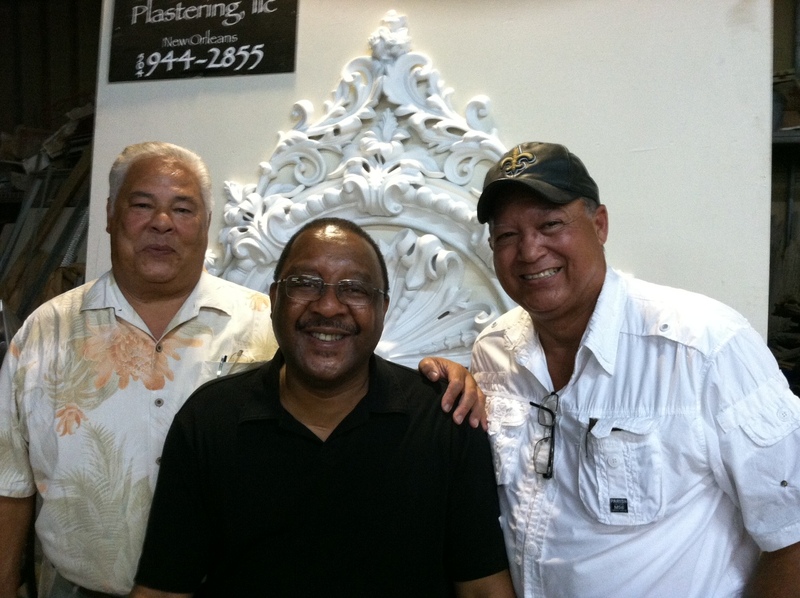 Master Plasterer Jeff Poree, NOMCG President Jonn Hankins, Master Blacksmith Darryl Reeves. Over a decade ago when Jonn Hankins worked at the New Orleans Museum of Art, he helped to organize an extraordinary exhibition called Raised to the Trades: Creole Building Arts of New Orleans. Its focus was on the craftsmen and artisan families who were the original builders of so many of this city’s magnificent houses. But more than that, it was an eloquent and poignant look at those still working in the building trades. 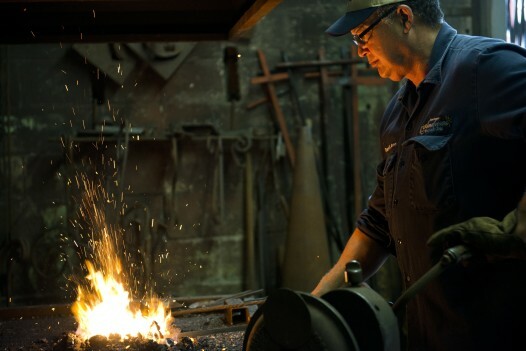 As the years have gone by, the number of skilled master craftsman has gotten smaller and smaller. For Jonn, who moved on from NOMA to a number of other positions around the city, it is a worry since he has never lost his admiration for the skill of those few master craftsmen remaining. So he has created the New Orleans Master Crafts Guild in order to pass along the knowledge of New Orleans’ still-living artisans. Its beginnings are modest and small. But who really needs these old-fashioned trades in this day and age anyway? After all, the construction needs of many of today’s houses, modest or McMansions, can be met through the vast and affordable inventories of this country’s big box home-building stores. Jonn says there definitely is still a need for individual craftsmen and artisans here. For, he explains, unlike other older communities with historic areas in defined compact sections – Charleston and Savannah, for example – we are blessed with an extraordinary number of centuries-old properties throughout the entire Crescent City. And, he adds, this trained community can also become the hub for an industry that can be exported. Not only are there other cities in need of such craftsmen skills, there are other countries, too. Take the case of a young Englishman who had not only discovered the joys of living in New Orleans, but had also expanded on his own skills as an historic building’s craftsman by observing that was occurring here. He was recently wooed back to his homeland to work on restoring a 17th century manor house there. In the coming months, NolaVie will focus on the skills and philosophies of our city’s remaining revered master craftsmen. In the meantime, for more information on the New Orleans Master Crafts Guild and its soon-to-be incubation center in the 7th Ward Community Center on the site of the former Corpus Christi School, visit info@nomcg.org.